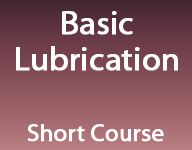 This course is presented in four parts: Friction, Lubrication, Wear I and Wear II. The module on Friction covers why we study friction, basic friction concepts, the 3 laws of friction, static friction and stick slip, and the adhesion theory of friction. The module on Lubrication covers the function of lubricants, viscosity, viscosity index, lubrication regimes including hydrodynamic lubrication (hydrostatic or elastohydrodynamic) boundary and mixed, additives, and the Stribeck Curve. Both modules on Wear cover the various mechanisms of wear. The first module covers mild adhesion, severe adhesion, polishing, abrasion, erosion, and cavitation damage. The second module covers contact fatigue, corrosion, brinelling, fretting corrosion, electro-corrosion and electrical discharge.